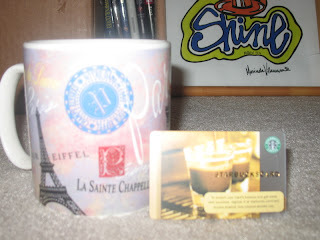 I got this really large Paris coffee cup and a Starbucks card for Father's Day. I like coffee. My kids know that. But what is so special about the card was that my son Levi got it for me himself. In fact, he found a bag and some tissue paper and put in the bag and brought it to me himself. His mother knew nothing about it. The truth is, there is really no credit on the card. He just picked it up off the counter at Starbucks in the mall, because he knew how much his daddy likes Starbucks. He's not quite old enough to know that you have to give them money so that they will put credit on the card. This is one time it really is the thought that counts. I love you Levi. I just found out that my wife blogged about this here.